It's party time again. Time to see what you have been up to since last week's party. Here are some wonderful features from last week. 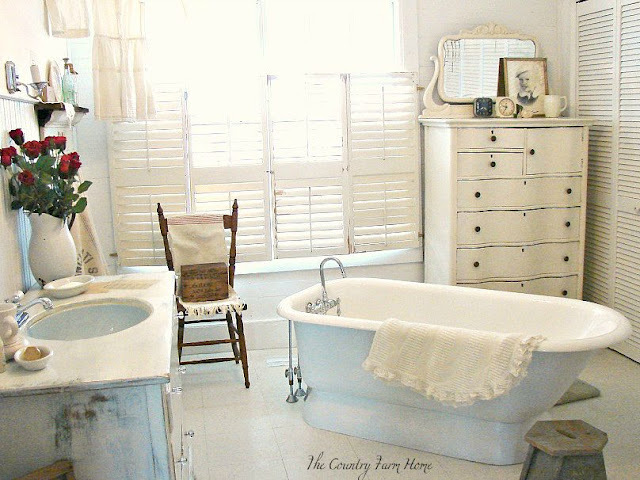 The Country Farm Home shared her wonderful vintage styled bathroom. Oh how I love that tub. 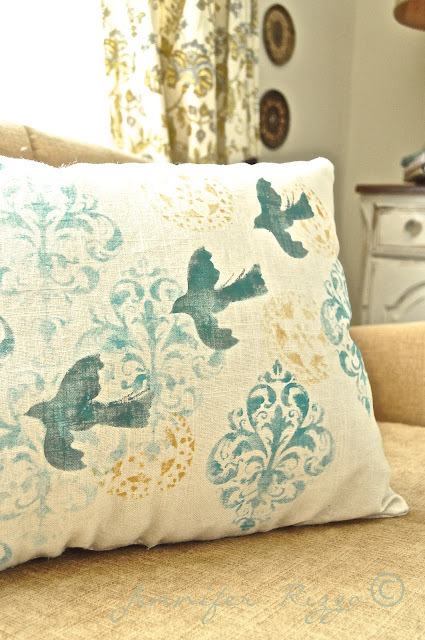 Check out this fabulous stenciled linen pillow by Jennifer Rizzo. This stenciled rug tutorial was shared by Life at Lydia's House. This cute tufted bench was shared by Birds and Soap. She shares the tutorial. Love this vintage styling by Blue Clear Sky with added flash cards. This beautiful cake was shared by Nalle's House. Thanks to everyone who joined in last week. Y'all rock! If you were featured feel free to grab a "featured" button from the sidebar. Now let's see what you have to wow us with this week! Great features Kim. Thank you for hosting and happy Valentine's Day! Love Jenn's pillow and that bath is fab! Thanks for hosting Kim! I love that bathroom! Thanks for hosting Kim! That bathroom makes me want to take a nice long hot bubble bath! Have a great night Kim! Wonderful features as always! Thank you so much for hosting! I love this party! Hi Kim! Great features, thanks for hosting! Beautiful features Kim, that tub is gorgeous and so is the painted pillow. Thanks for hosting! Thank you for hosting, Kim. I have got to check out that bathroom. LOVE that tub! Thanks so much for hosting - great features! Thanks for hosting, Kim. Hope you have a great week! Hi Kim! I'm working on my bathroom now... and while it does not look like that, it's so nice to be inspired :) It's really cute. Congrats to all the featured bloggers. Have a wonderful week and thanks for hosting!! Thanks for the party, Kim! You sure know how to draw a crowd. Thanks Kim! I hope your week is off to a good start, love that bathromm, ahhhh. Oh what a bath! Thanks for hosting Kim! Wow, that cake certainly looks fabulous! Thanks for hosting Kim. 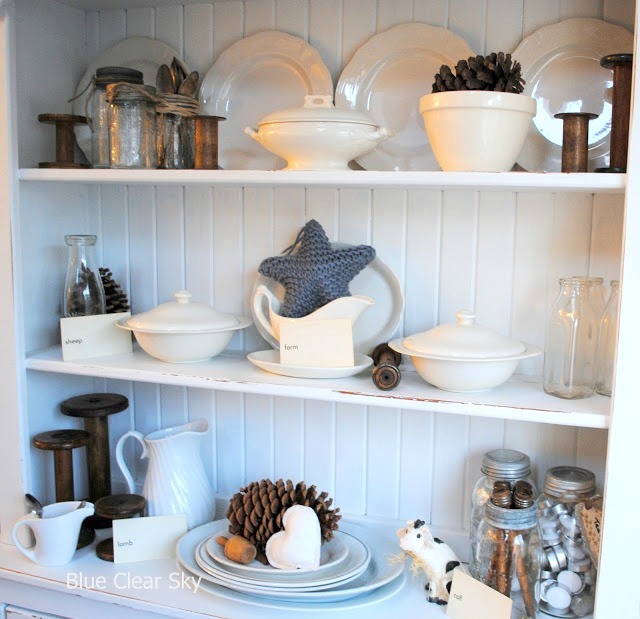 Thanks so much for sharing my winter hutch, Kim. I'm in great company. Thanks for hosting too. Thanks so much for featuring my cake! I'm glad to be included amongst such inspiring projects. Thank you for having me again at your fun party, Kim! I am sharing ideas for small gestures for Valentine's day; I hope your readers will be inspired to make the day really special. Have yourself a lovely Valentine's Day! 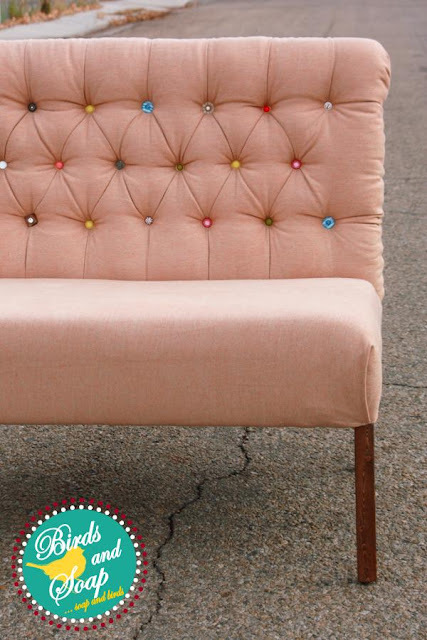 How fun is that tufted bench?? I love all the multi colored buttons :) Thanks for the party ... can't wait to check everything out! I love that stenciled rug. Thanks for hosting Kim! Love that farmhouse bath! Thanks for hosting,Kim! Happy Valentines this week! Wow Kim, your picks are really beautiful this week (as always)! I so enjoy the party. Thanks so much for hosting. Have a great week. WOW! You chose some really great features this week, Kim....thanks for hosting! Kim, isn't the talent of bloggers incredible? Thanks for sharing these features... so much inspiration!!!! Now I'm off to visit! Thanks for featuring my bench!...Thank you for hosting too! Thanks for hosting the party Kim.....great features!! Kim, thanks for bringing so many great blogger together with your party! thanks for the party Kim! enjoy the rest of your week. Thanks for having a great party, Kim. Have a wonderful Valentine's Week! I love the strawberries cut to resemble hearts. So cute! I will be doing that for my girls on Valentine's Day. Lucky me that Winn-Dixie had strawberries buy one, get one free today! Hi Kimmie! Wow! Some wonderful features. I love that stenciled pillow! I'm not very wowiing this week but I'm off to check out the party goers. Nice features, specially that cake!! Thank you for hosting dear Kim. Hope you have a great week. Always an awesome party Kim! Great features too! Hi, Kim! So very glad to be joining you this week! Thank you! Always fun to be here, Kim. Thanks for hosting! I love that cake! They spent a lot more time carving the strawberries than I did. Thank you for hosting Kim. Such an honor to be featured, Kim! I have to admit, I was surprised--but thrilled. Thanks so much. I love your parties! Great features! Thank you for hosting...I love that bathroom. I am off to mingle with the other guests! Thanks for hosting. Your party is so fun because there are so many blogs in one place. I visited as many as I could...if only there were more time!! My head is spinning from all the inspiration. Thanks for hosting. Im very late for the party this week, was afraid to link up anywhere with all the malware going around. Thanks for hosting! Linking up my Antibes chair ~ thanks for hosting, Kim! Thanks for hosting, I just love the pillow and I have been wanting to do a rug and this makes it sound so easy! Happy Valentine's Day! Thank you for hosting. Wow, the bathroom you featured is amazing!! Gorgeous features- I love that bathroom!! Thanks for hosting! Thanks for hosting! This party brought me lots of visitors last week! I've been sufficiently Wow-ed by the fab features from last week1 GREAT ideas and awesome photo's. Thanks for putting on these weekly parties! Thank you for hosting. I'm sharing my Valentine's Day box with you. Have a great week. Thanks for hosting. Beautiful features as always! Beautiful features, as always Kim. Enjoy the rest of your week! Thanks so much for the feature, Kim. I always enjoy the party and thanks for hosting. Thanks for hosting Kim!Have a great weekend!